Fireman Marc Pelster crawls on a ladder, which simulated the rafters of a building. On Wednesday evening, March 22, 13 members of the Petersburg Fire Department attended a workshop in Petersburg instructed by the Fire Marshal on air pack training (self-contained breathing apparatus) dealing with air consumption while under stress. After EMT’s took the firemen’s vitals, all were required to go through an obstacle course in full gear with air packs on as many times as possible. Among the many obstacles were maneuvering through a culvert, hitting a tire 10 times with a sledge hammer, dragging a weighted dummy to the rescue truck, climbing a ladder, crawling on simulated rafters (some while carrying a fire hose. After completing the obstacle course, each fireman was monitored for the amount of oxygen remaining in his blood after using a full tank of air. This was the second workshop dealing with the subject. One or more workshops may be scheduled. 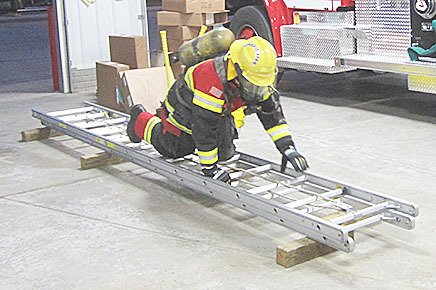 Chief Baumgartner stated that this is a way for firemen to understand the dangers associated with the use of any self-contained breathing apparatus, to recognize the effects on the body, and the human cost of being complacent.